Why precast technology is important for construction? By TGR Team August 3, 2018 August 3, 2018 Comments Off on Why precast technology is important for construction? Amid rapid urbanisation and global climate change, precast technology is being deployed by real estate developers for multiple reasons. The aspiration towards an environmentally-responsible industry promises to promote a wider use of prefabricated elements in coming years. The construction industry is often blamed for being labour intensive and polluting. Most buildings in India are still built with conventional methods involving in-situ concrete, timber formworks and wet trades with high manpower requirement. However, there is a growing awareness on green building practices. Many new techniques and technologies available today can reduce carbon footprint during the process of construction as well as lifecycle of a building. So efforts are being made towards sustainable development involving optimal use of natural resources, reduction and recycling of wastes, and significantly minimise pollution emissions. The main advantages of precast technology are quality, speed and value for money. It can help in time savings of up to 64 per cent compared to similar projects using normal construction methods. If a brick-and-mortar method takes one year to complete, the precast method can take about four months. The good part is that it not only speeds up construction work but also enhances the quality of final output and helps create in bigger carpet area. Structures do not need plastering as this method makes a surface smooth, resulting in little maintenance. Precast technology strengthens the overall solidness of a building and also brings down construction cost by 10 to 15 per cent. It can be used to bridge the demand-supply gap in affordable housing segment. Being a versatile technology, it is suitable for all types of construction: high-rise, low-rise, villas, commercial projects, parking lots, etc. At a precast manufacturing unit, roof slabs, wall panels, beams, columns and floors are fabricated. There is a defined space for windows and doors. All fittings like electrical, plumbing, TV, telephone, etc are laid before concreting. Everything is controlled through computer-based monitoring system. Various components are manufactured or cast in controlled environment and erected on the site with tower cranes. The components are then joined to each as per specification with grouts and screed to provide rigidity and requisite strength to the structure. Precast technology brings a world of creative possibilities in application and design with abundant choices for architects and engineers to create future-ready buildings unique in character and of exceptionally high quality. Precast concrete is specifically designed and made to have a significantly high span-to-depth ratio that allows it to bear loads better, thus reducing the need for additional columns and supports within the internal structure of a building. Its lighter weight can also reduce the size of needed structural material and overall foundational depth. The strength is not sacrificed by its lightweight construction. It stays secure and can even be put under reduced dead loads when properly installed. All of that weight savings paired with high strength means buildings can use precast concrete to reach heights of up to 80 stories. Precast concrete uniformity also mutes vibrations that move throughout the building. For large-scale projects, especially those with open areas like concert halls, vibration in seats and stands is reduced. It also minimises the risk of structural damage from large crowds. These elements combine to make precast concrete an extremely safe building material that can help construction crew meet the safety requirements for projects of almost any size and shape. Some buildings like an airport have a vast array of technology that must always be operable. But it cannot have wires or other overhangs that move across its yard. This means everything possible runs through the foundation and base of the buildings. Precast concrete allows construction teams to pre-install utility access, fixtures and other elements. Some of the more common inclusions are plumbing and communication lines. During and after the precast concrete is made and moulded, different utility panels can be added and installed. Construction crews get instant access to utilities and other elements and there is less need for revisions or alteration of the concrete. Precast concrete can withstand flood damage, wind-blown debris and rain penetration. Some studies show it can withstand many freeze-thaw cycles even better than other construction and building materials. It will not decay or crumble as it expands and contracts. Large-scale infrastructure requirements create unique weather and element demands, including the ability to keep heat in during the cold months and keep heat out in the summer. If the right materials are not used, costs can go up significantly all year long. Precast concrete leads to thermal efficiency. Since it is denser and less of a thermal conductor, it does not allow heat to move around the building. That means reduction in peak heating and cooling loads. Precast concrete is also fire-proof when properly constructed and combined with the right insulation and panelling on walls and ceilings. It can limit fire’s ability to spread between rooms. Using precast concrete for all of the walls in a stairwell means that people inside will be protected. Any harm or loss of life will be limited in the event of an eventuality. In most cases, only panelling will need to be replaced – not the concrete underneath. The damage would be mostly cosmetic, not foundational. In areas like floors or ceilings, a little cleaning and applying a new coat of paint will do well. 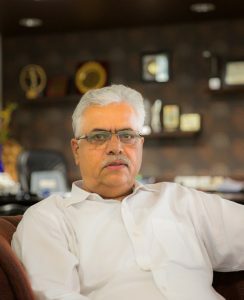 The author is the Chairman of Supertech Limited.